One of the most amazing cut flower species in the industry. 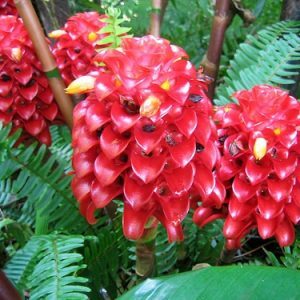 The stately dark red cone bract similar to an upside down pineapple is hard to the touch. When in bloom it will emit small yellow flowers within its barbed bracts creating an exquisite show. Foliage is lush and green spiraling around it’s bamboo like canes.